For those of you who are unable to be here for our Open House and Dedication, we have created a virtual prayer tour of the home so you can join us in giving glory to our Lord for all He has accomplished here at Grace Babies' Home. At GBH these next few weeks feel like we are in a dead sprint to get things finished up before October 22nd when we plan to host our open house. God continues to bring exactly what we need when we need it, and this weekend was a testimony to that faithfulness. A handful of faithful servants from Westgate Church in the bay area worked long days and often into the night helping to get our facility ready. They worked on various building and carpentry projects, concrete work, finish painting, installing fixtures, sorting donated items, and so much more. God truly blessed the work of their hands. PRAY - Pray that the Lord would move mountains to get a truck load of furniture down here that is waiting for proper customs agents with proper permits to move it through the border. Pray for our iron guy, that he would be able to get the fence job done in a timely manner. 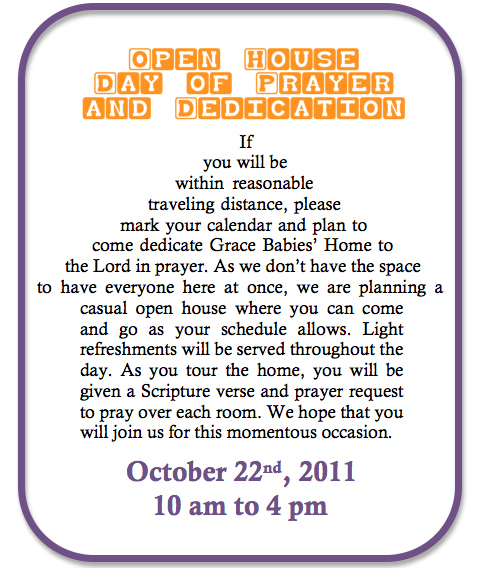 SHARE - Invite someone new to the ministry of GBH to join you at our Open House, Day of Prayer and Dedication. This weekend Santa Cruz Bible Church returned to México to bless us by completing several projects at the Baby Home. The bathing room is now complete along with several bench storage units for the playroom, a new microwave oven in the kitchen, and door hardware on the front doors.. Our purified water system is fully functional and delivering clean water to the bathing room and all of the kitchens in the building. PRAY - Pray that all the items on our list of things to complete before our Open House would be completed. GIVE - As we draw closer to receiving our first babies, we need faithful monthly sponsors to provide for their constant care. Would you consider answering God’s call to defend and care for the fatherless by becoming a baby sponsor. Click here to start your monthly sponsorship. It never gets old watching the Lord miraculously coordinate blessings for Grace Babies' Home. I have seen it so many times that if I blogged every one of them, I wouldn't have time for anything else. However, I feel led to share a little of what the Lord has been up to this weekend with a few good men and some of the resources that are ultimately at His disposal. About once every other month for the last year we have had a group of faithful men come to work on the Baby Home from Grace Chapel of Indio. Rody Johnson has been on every one of these trips and has come down a few times on his own to keep things moving here at GBH. Rody is a retired police officer who now works part-time for the police department. Several weeks ago Rody was told that due to a clerical error he had worked too many hours for a retiree and had to take two weeks off. At the same time his son-in-law who is a contractor just happened to be starting a large remodel project needed some help demolishing a kitchen. He asked Rody to come and help. When Rody saw the beautiful kitchen cabinets and granite counter tops, he thought they would be useful for the downstairs kitchen in the Baby Home. For 6 hours, he carefully removed the cabinets and counter tops and loaded them into a trailer. I received an email with pictures of the cabinets and countertops and immediately made plans to drive out to Indio and collect them. Two men from Grace Chapel of Indio were there to help me and a fellow missionary friend load the cabinets: Rody and Anthony Dean, another faithful member of the GCI teams that have come to GBH. Anthony is a contractor who just happens to specialize in tile and granite. We loaded the cabinets into the trailer and made plans for Anthony to bring the granite down a week later. This weekend, three faithful servants from Grace Chapel Indio came down to install the countertops: Rody, Anthony, and my father-in-law, Lonnie, through whom we were first introduced to GCI. The most amazing part of this story is the fact that the cabinets fit perfectly into the GBH kitchen. We didn't have to modify them in any way. When it was all installed Anthony remarked, "It is like someone designed these cabinets for this kitchen." "Someone did," I replied. This story of God providing above and beyond what we had imagined, and then bringing His servants with the exact skill-set to accomplish the work can be told over and over again in regards to this project. It is truly a work in which the glory belongs to God. PRAY - Pray for the workers who will serve at GBH. God has selected them and is preparing them for service. As we begin to work with the Mexican Social Services (DIF) it is becoming more clear how important it is to have staff with medical training. SHARE - If you didn't receive this blog via email, you can subscribe in the "follow by email" section on the right side of this blog. If you did receive the email, please forward it to your friends and family. Or use the "share" buttons to share with your social networks. GIVE - Sponsor a baby here. This weekend a lot of progress was made as we hosted a couple guys from Grace Chapel Indio for a few days and a group from Horizon Christian Fellowship on Saturday. Cabinets were installed in the downstairs kitchen. Walls were primed in the upstairs apartment and almost all the walls downstairs were textured. Baseboards and doors were painted and two bathrooms were tiled. We have a team of youth from Utah here all this week and they will pick up where these two groups left off. PRAY – Pray for the group of youth working this week. That they would be kept safe and that God would bless them richly as they serve Him here in Mexico. SPONSOR A BABY - If you feel called to support this ministry with your finances, your $40 monthly sponsorship will help care for the needs of an orphaned baby while contributing to the operations of the home. Click here to begin your sponsorship. This weekend we were visited by a team from Santa Cruz Bible Church. They served in various ways at GCH and part of the team kept busy working on the drywall downstairs at the Baby Home. Mudding and sanding drywall is a labor of love and this crew truly showed their love for the the Lord and His ministry here at GBH. About a month ago we received an email from a dear friend encouraging us to enter a video contest for the Do Something World ministry with The Rock Church in San Diego. 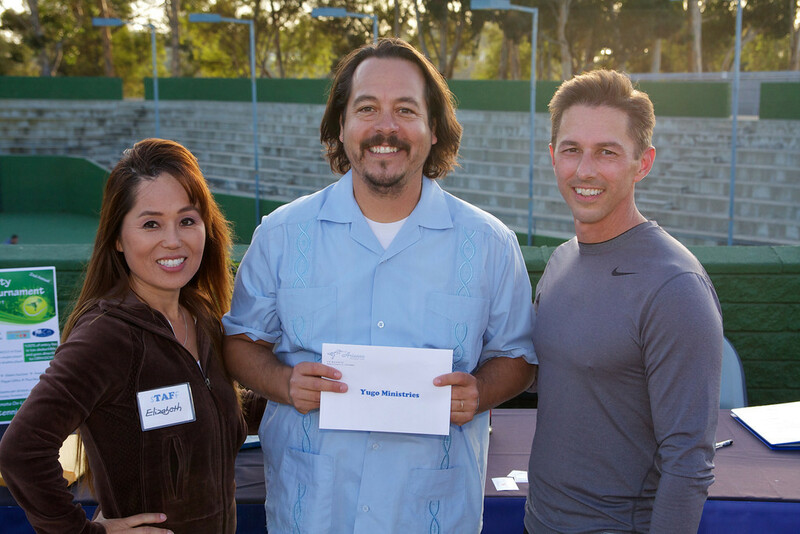 The grand prize is $5,000 with the top 50 videos all receiving a cash prize. The video entries should be designed to encourage church, business and government leaders to harness the power of volunteerism, by mobilizing individuals to do something to transform their communities. After viewing a few videos already submitted, we quickly grew intimidated and dismissed the idea. Last night our friends emailed us again to remind us that the deadline is Saturday, April 30th. They pointed out that the Lord's work at Grace Babies' Home perfectly captures the spirit of the Do Something World ministry and encouraged us to pull something together. So here it is, a bit last minute and homespun. To God be the glory. YUGO Ministries, Grace Babies' Home from Juan Strutton on Vimeo. This week we made a great deal of progress on several fronts. First, thanks to faithful GCH volunteer, Jerry Canning, we were able to finish the septic system by installing the last of the drain fields. Also, we had our dear friend and electrician, Chris Mellor, here to connect the building to the main power coming from the street and activate a few circuits upstairs. Tim Whitcomb from the Horizon team that was here last week returned to finish painting the kitchen cabinet doors for the upstairs residence. Lastly, we were blessed by the return of Denny Foster and friends from Huntington Beach who spent the weekend building and painting the railing for the second floor patio and helping with various kitchen and bathroom projects. PRAY - Pray that the Lord would continue to send workers to keep things going. SHARE - Many faithful servants who have volunteered here have taken their experience at GBH and shared it with their home church. Would you be willing to do that? GIVE - Rather than give financially, please take a moment or two and read through the daily prayer requests from our 40 Days of Prayer and Fasting and pray them to our Lord. The last few weeks have been busy and many prayers have been answered with regard to Grace Babies’ Home. The stucco phase of the project is finished and the building is now fully protected from the elements. We were visited yesterday by Horizon Christian Fellowship who kept busy painting, drywalling, cleaning, organizing, and fixing. They also installed vanities, toilets and ceiling fans in the upstairs residence as well as helped a dear friend and helper Marvin Weiss. Marvin and his family were here for 5 days and he built all the drawers and cabinet doors for the upstairs kitchen. Marvin is an accomplished wood worker and was invaluable in helping move the kitchen a giant step closer to completion. PRAY - That God would send more teams to come and work on the Baby Home and fill the empty spaces in May on our team calendar. SHARE - Would you consider organizing a trip with your friends and family to come and serve at Grace Babies’ Home. E-mail juan@josh2415.org for more details. GIVE - Have you considered giving up something and donating the cost to Grace Babies’ Home? Click here. to learn more about our 40 Days of Prayer and Fasting for GBH.